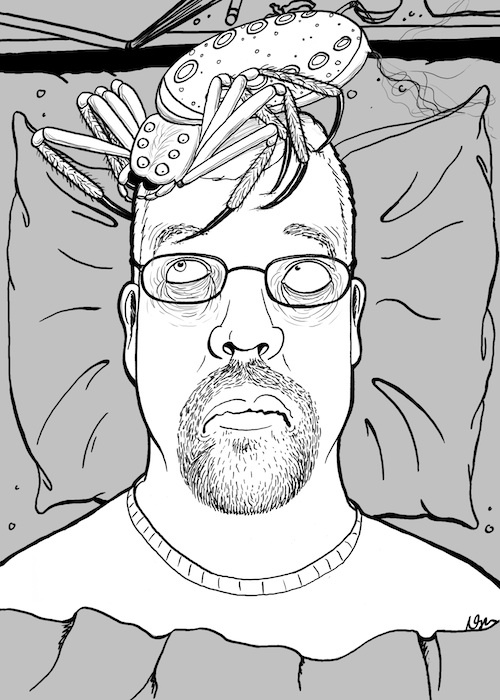 Spider on My Head: Day 7 | Kris Johnson's Blog…sort of. If I’ve learned anything from seven days of spiders on my head, it’s that I probably wouldn’t have a head after the eighth day. And while I’m sure an illustration of my decapitated corpse might appeal to someone—this is the Internet, after all—it’s not likely to be anyone who reads this blog with any regularity. Art by Natalie Metzger (AKA, The Fuzzy Slug). Many, many thanks to Natalie for turning my silly whim into…not reality, but perhaps surreality. As always, click the image for added embiggaliciousness. FUN FACT: Just as the spider in today’s illustration is watching me, there is probably a spider watching you right now. Watching you with eight eyes. Tell me that doesn’t make you just a little bit paranoid. Previous PostSpider on My Head: Day 6Next PostNot so fast, buddy. This is a great series. Very clever.